When this happened, I was SOOOO EXCITED! Th artwork above was reposted on their social media accounts a few months ago. 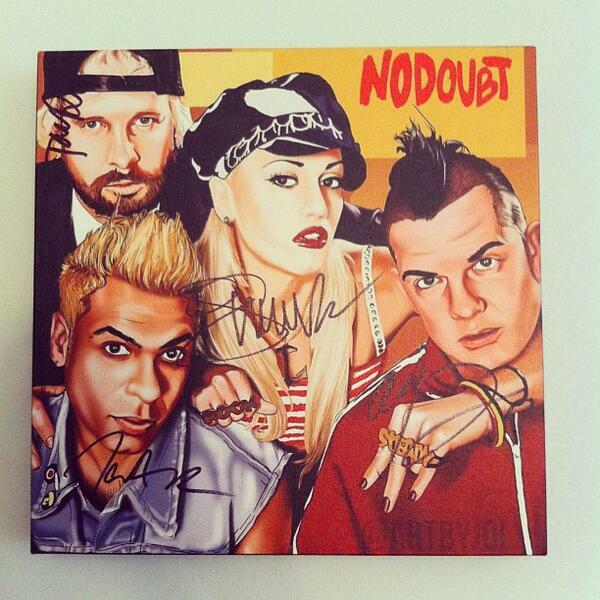 I found I had won an autograph for my art through No Doubt’s official Twitter account (https://twitter.com/nodoubt/status/390961954170216448/photo/1). It’s a really cool thing they do with their fans’ artwork. If you tag your fan art with #NDArt, they will repost it, get your info, and send your work to you autographed by them! I’ve been a fan of No Doubt since ‘Tragic Kingdom’ and I am still determined to meet them someday. I remember when my mother bought the ‘Tragic Kingdom’ CD in 1996 at the Virgin Megastore in New York. I loved going to record and cd stores and listen to new music. It was a great day because I normally never got anything. My mother was very cautious about what I should and shouldn’t listen to. She actually banned my brother and I from listening to Rage Against the Machine and other bands! It was a good thing when I think back because I was encouraged to listen to positive messages in music.